This is Part 1 of (probably) a 2-part series over the next few weeks. It is about the business of blogging and running PFB. Many of you don’t care about that — just give me the crootin news! — but I know some of you do care about the future of the site, and that’s what I’d like to talk about. On Tuesday of this week at about 7:30 a.m. after a 2-mile run to start my day, I scooped my 4-year-old daughter up at our island countertop and grabbed my iPad. No games or cartoons, though. We thumbed through the New York Times and eventually settled on an article about German kindergarten students who study outdoors instead of in climate-controlled buildings. I read it aloud to her. Part of this is because I want her to be knowledgable about the world, and part of it, if I’m being honest, is that I recently subscribed to the Times, and I want to get the most out of my $10/month (OK, $5 — I split it with my brother) subscription. I don’t have to subscribe to the Times to read it, but it delights me so I do (more on this in a second). The Times is one of about 10-12 of our family subscriptions. Others include Dollar Shave Club, Wikipedia, Netflix, Desiring God, Tim Challies’ blog, Kottke.org, JeffGluck.com (because I like him, not because I care about NASCAR) and our local municipal golf course where we pay $30/month for unlimited range balls and discounted twilight rates. For most of these, I get something in return for my money. If I don’t pay my golf course, they don’t give me balls for free and I have to pay $8/bucket for them. This is our transaction. But for a handful of these, I get something in return that I would get anyway even if I gave them no money. This is true of Kottke, DG, Wikipedia and even the Times (if you know how to manipulate cookies). That is, these sites are reader supported but do not have paywalls (or in the case of the Times, secure paywalls). So why in the world would I give money to something that is free for all and that I could consume without paying for? After some deep brainstorming sessions with our consultants from Yeah Local, we came to the conclusion that it’s time to diversify our revenue streams, though, and in June, we’re going to be asking people to help support our site with a monthly contribution. The minimum contribution will be quite small and quite voluntary (i.e. no paywalls), though we encourage anything you can contribute. This is the first step in what will be a years-long journey of transitioning into a multi-revenue stream era here at PFB. In almost every thriving media organization I can think of, the financial undergirding is the actual humans that consume the news and podcasts and videos and humor. I know asking for your money is a big deal. Or it is to me. That’s why it has taken so long to get here. I’m terrified of it, to be honest. But this is the reality of digital media in 2017. Ad revenue is breaking down and probably not sustainable in the long term (although it’s not going anywhere in the short term). Other revenue streams can be lucrative but not necessarily long-term sustainable (think: merchandise). Everything else is either scammy or illegal. There is often not a good financial relationship between readers and publishers within digital media, but there needs to be for a future that still includes quality publishers that you guys enjoy. You might not agree with this idea — according to our survey, many of you don’t — but it’s a step I feel confident and convicted about us taking. Paying for sports news online feels … weird, but all future publishers will either do this or be subsidized by TV money (i.e. ESPN). I feel confident of that. Plus, you’re not really paying for the news — it will almost certainly always be free at PFB — you’re only paying to support the people who are creating it and because you like what they’ve created. This is us building not for 2018, but for 2025. That might not seem like a lot, and maybe it’s not. But I know a lot of you are just glad a place like PFB exists and want it to for years and years and years. Paying monthly for our entertainment and news is a trend Farhad Manjoo of the New York Times wrote about recently. This is encouraging to somebody like me and should be to you, too. In a world of too much noise, the good stuff will be supported and exist into the future. Yes! I love paying for the sites I pay for even if I don’t need to because I know my money goes towards creating more of what I already love. My hope is that you are willing and able to adopt what Richard Kim, executive editor of The Nation, told CJR about his site. I don’t know if we are a cause, but I do know that many of you want us to be around for a long time. It’s difficult to explain to people why they should pay for something that is and likely always will be free. PFB is not going to a paywall model. We will not have premium content. We are not changing anything we do. We are only changing how we fund it. We’re hopeful that as we start to diversify our revenue streams with reader support as the one we focus on most that people who get it will get it. The more you guys pour into us, the better our product will be for you. It’s an age-old relationship that has recently been disrupted by varying levels of third parties. Here’s how Poynter put it recently. This (reader supported) model has its upsides. By focusing on subscribers, these media entrepreneurs are able to draw on a revenue source that’s relatively stable. Because no single major advertiser or sponsor controls their financial welfare, they’re protected from swings in advertising and catastrophic business shifts. Jason Kottke was even more to the point when he started asking for money last fall. This journey for me started when I read about the guys who run Wait But Why and how they funded it through Patreon. It was a startling revelation for me that readers would love something so much they would pay money for it even if it’s free for everyone else. Then I realized I do the same thing. So I’m not sure if all of this makes sense or if I’m properly conveying what I want to convey. But I do want you to know that I love this site a lot. It is my (work) baby. 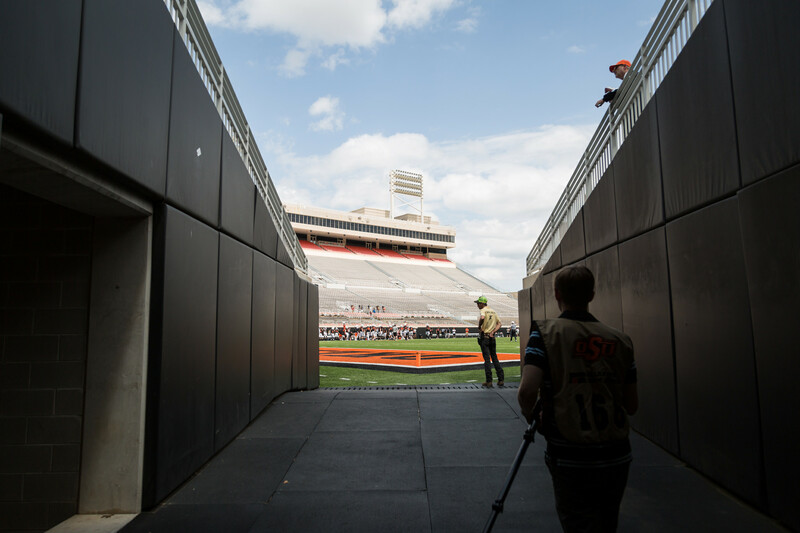 It keeps me up at night (literally, a lot of nights), and it has been a delight to write and joke and talk about Oklahoma State sports for the last six years. It has been an even greater joy for me to pay our writers and podcasters to do the same. I learned when getting my MBA at Oklahoma State that building a business was difficult, complicated and honestly, it didn’t seem all that fun. They got the first two right, for sure, but not the last one. Building this business is almost always a pure delight to my entrepreneurial senses, and I hope we’re able to do that for you guys for a long, long time.